A virtual field can be used in a request as though it is a real data source field. The calculation that determines the value of a virtual field is performed on each retrieved record that passes any screening conditions on real fields. The result of the expression is treated as though it were a real field stored in the data source. In a Master File. 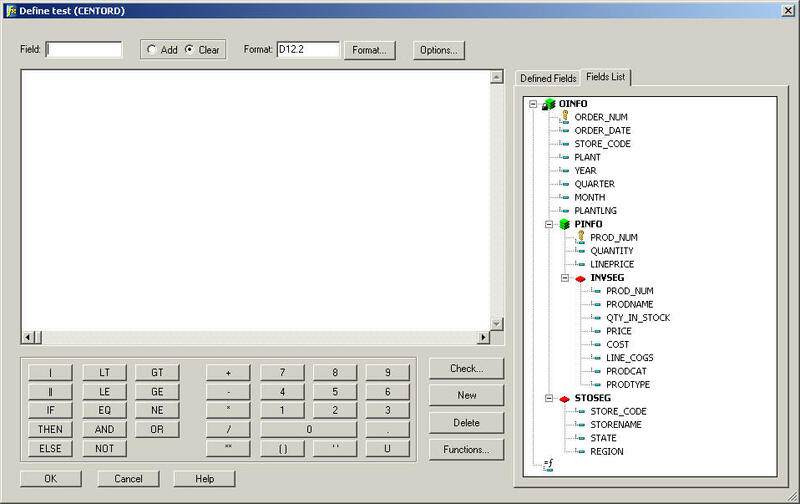 These virtual fields are available whenever the data source is used for reporting. These fields cannot be cleared by JOIN or DEFINE FILE commands. In a procedure. A virtual field created in a procedure lasts only for that procedure. Tip: If your environment supports the KEEPDEFINES parameter, you can set KEEPDEFINES to ON to protect virtual fields from being cleared by a subsequent JOIN command. When a JOIN is issued, all pre-existing virtual fields for that data source are cleared except those defined in the Master File. To join structures using a virtual field with the source, make sure the Define follows the Join. Otherwise, the Join clears the temporary field. For an explanation of reporting on joined data sources, see Joining and Merging Data Sources. If you edit a DEFINE and change the name, you will still see the original DEFINE, in addition to the new named DEFINE. If no field in the expression is in the Master File or has been defined, use the WITH command to identify the logical home of the defined calculation. WITH can be used to move the logical home for the virtual field to a segment lower than that to which it would otherwise be assigned (for example, to count instances in a lower segment). You may define fields simultaneously (in addition to fields defined in the Master File) for as many data sources as desired. The total length of all virtual fields and real fields cannot exceed 32,000 characters. When you specify virtual fields in a request, they count toward the display field limit. Virtual fields are only available when the data source is used for reporting. Virtual fields cannot be used with MODIFY. A DEFINE command may not contain qualified field names on the left-hand side of the expression. If the same field name exists in more than one segment, and that field must be redefined or recomputed, use the REDEFINES command. Using a self-referencing DEFINE such as x=x+1 disables AUTOPATH (see the manual). Right-click the procedure in the Procedures folder and choose Edit in Developer Studio tool from the context menu. The Procedure Viewer opens. Click a component connector (yellow diamond) at the point where you want to include the virtual field in the procedure, then click the Define button on the component connector toolbar. The Open dialog box opens. Select the Master File from which you want to create the virtual field and click Open. The Define dialog box opens. For details see Define Tool. Type the name of the virtual field in the Field input box. Enter an expression in the expressions box. See specific procedures for details on assigning alphanumeric, numeric, date, and CLOB formats. For information on expressions, see the Creating Reports With WebFOCUS Language manual. You can also use a function in an expression by clicking the Functions button on the Define dialog box. For details on functions, see the Using Functions manual. Note: If you want to make a virtual field available for use with all procedures during your session, issue the DEFINE command from the Command Console. The virtual field is retained for the duration of the session. Select Alphanumeric as the Format Type. For more information on field formats, see Assigning Field Formats in the Creating Reports With Report Painter manual. If you wish to include numeric display options, select these options in the Edit Options section. Select Define from the component connector toolbar in the Procedure Viewer. From Report Painter, right-click anywhere in the Fields tab of the Object Inspector and select New Define Virtual Field. Click the Options button and select the Override missing values handling check box to specify how the missing value attributes are handled. The Options dialog box is shown in the following image. Select the Associate the temporary field with the real field that is selected check box and select a field. The Options dialog box is shown in the following image. For more information about Missing Field Values, see Establishing a Segment Location for a Virtual Field in the Handling Records With Missing Field Values chapter of the Creating Reports With WebFOCUS Language manual. You may wish to have more than one set of virtual fields for the same data source, and to use some or all of the virtual fields in the request. The Add option enables you to specify additional virtual fields without clearing existing ones. If you omit the Add option, previously defined virtual fields in that data source are cleared. If you want to clear a virtual field for a particular data source, use the Clear option. In the Define dialog box, type the field name in the Field input box. Select the Add option button. You can display all virtual fields with the ? DEFINE command. You can also access this information in the Define tool. Click the Defined Fields tab in the Define tool. A new list of virtual fields for the same data source without the Add option selected. A join. When a join is created for a data source, all pre-existing virtual fields for that data source are cleared except those defined in the Master File. This may affect virtual fields used in an expression. A change in the value of the FIELDNAME SET parameter. Unlike fields created in a procedure, virtual fields in the Master File are not cleared in the above ways. In the Define tool window, with the field in the Field text box, click Delete. Virtual fields can be compiled into machine code in order to increase the speed of calculations. When you enable compilation of expressions, expressions in IF criteria are also compiled. In some cases, an expression in an IF test may contain too many elements to be compiled (the limit is 8192). In this case, a FOC1975 message is generated to indicate that the expression could not be compiled. However, the report completes successfully, and the expression is evaluated correctly without compilation. Dynamic formatting enables you to apply different formats to specific data in a column by using a temporary field that contains dynamic data settings. You can create a dynamic format by writing an expression using the Define tool inside or outside of Report Painter. Before you can format a report column using the dynamic format, you must create the report, then apply the temporary field to a column in the report. For example, you can create a temporary field that contains different decimal currency formats for countries like Japan (which uses no decimal places) and England (which uses 2 decimal places). These currency formats are considered dynamic formats. You can then apply the temporary field containing the dynamic formatting to a Sales column. In a report, the Sales column reflects the different currency formats for each country. Click Format and type A8 (Alphanumeric, 8 characters). Click OK. Type the expression in the Expressions window or use the Fields list, calculator, or functions list to help you create the expression. The expression should contain the parameter values necessary for defining the dynamic formatting. All expressions must be written in uppercase. You can apply dynamic formatting to a report column. Right-click a report column in Report Painter and select Format. Click the Dynamic option button in the Format Types area. Select the field with the desired dynamic format from the Format Field drop-down list. Click OK to format the report column. For more information about Report Painter, see the Creating Reports With Report Painter manual. The following example demonstrates how the dynamic field format can be used to set different currency formats for specific countries in a report. Open the procedure for which you want to create the virtual field, then open the Define tool from the component connector toolbar. Type MYFORMAT in the Field box. Click the Format button. Select the Alphanumeric option button, and specify 8 as the length. Click OK. Select DECODE from the Select a function drop-down list. The DECODE function appears with placeholders for its arguments. Select COUNTRY as the DECODE field name. Enter the actual and display values by typing the following placeholder fields with specific values that define the decimal precision for each currency: ENGLAND P15.2C JAPAN P15.0 ELSE P15.2M. Enter the default value P15.2M to be assigned if the code is not found among the list of codes. Click OK to return to the Define tool. The DECODE function appears as the Define expression. Click OK to close the Define tool. Select Report from the Connector toolbox. At the Open dialog box, select CAR from the list of Master Files and click Open. In Report Painter, double-click the COUNTRY and SALES fields in the Fields list. Select the SALES column and click the Sum button on the Columns toolbar. Right-click the SALES column and select Format. Click the Dynamic option button and select the MYFORMAT field from the Format Field drop-down list. Click OK to apply the formats associated with the MYFORMAT field to the SALES column. Select the COUNTRY column and click the By button on the Columns toolbar. Run the report, as shown in the following image. Notice that the SALES column displays the format variations you defined for each country in the DECODE function.